The aim of the Mars Science Laboratory (MSL) is to explore the planet Mars through the use of the rover Curiosity, focusing on one particular site on the planet that seems conducive to the preservation of possible traces of life on the planet. Curiosity landed on Mars on 6th August 2012. 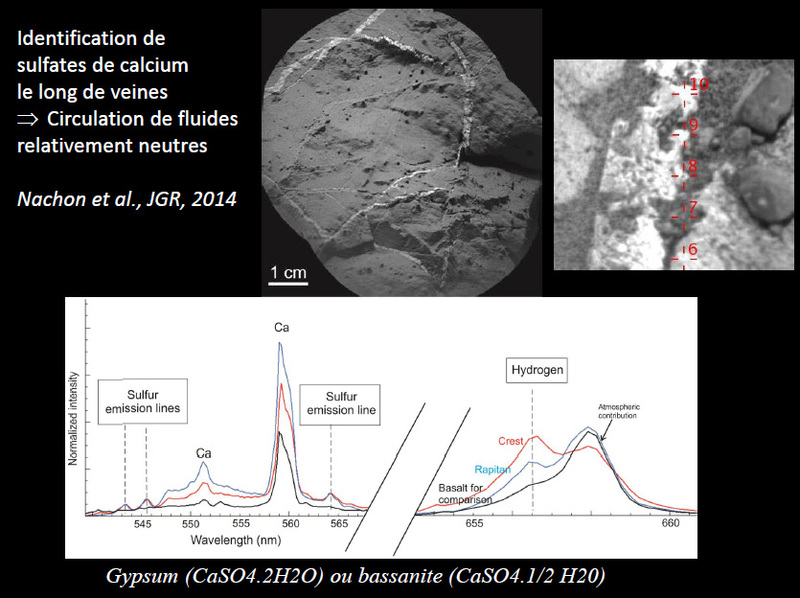 The ChemCam instrument on board Curiosity was designed to analyse the chemical properties and texture of the rocks and soil around the rover. The ChemCam employs a technique involving spectroscopic analysis induced by laser ablation. A powerful laser is fired at a target, which results in the volatilisation of the material raised to >10000K and the appearance of a plasma, the fluorescence of which is then analysed from a distance using UV-visible-near IR (250-800 nm) spectroscopy. Analysis of this spectrum gives the chemical composition of the target in terms of its major elements as well as some minor elements and traces. Two images are taken using the RMI (Remote Micro-Imager, coaligned with the laser) before and after the laser is fired, which are then used to study the texture of the rock being analysed. In January 2015, ChemCam fired 200,000 laser shots. Partners and collaborations : MSL/Curiosity is a NASA mission. The ChemCam instrument is the responsibility of an American PI (Principal Investigator), Roger Wiens (Los Alamos National Laboratory). France’s contribution to the ChemCam came in the form of the laser, the telescope, the RMI camera and the electronics used in these instruments. The French section is the responsibility of Sylvestre Maurice from the IRAP (OMP/Toulouse). The OSUNA makes its contribution to this instrument via the LPG in the form of three permanent members, one co-investigator and two associate members, respectively N. Mangold and S. Le Mouélic and Laetitia Le Deit. These figures participate remotely in the rover Curiosity’s operations on a daily basis. We participate in tasks involving the processing of data arriving on Earth (generally within a day of its arrival), the programming of the ChemCam for the following day’s activities, particularly the selection of analysis targets, and programming the rover itself via project roles (the chair of the Geology group, who programmes the rover’s geological activities and the Long Term Planner, which is a monitoring role, the responsibilities of which include overseeing rover-related activities on a medium and long-term basis). Roughly 3 days of operations are carried out per month and per person, with such operations only ever carried out at night between the hours of 5pm and 3am.